– Seasonal catch limited to 118,000 tons (236 million pounds). – Weekend closures (from noon Friday to noon Sunday). – Squid monitoring (port sampling and logbooks). – Limited entry permits (In 2012, 71 purse seiners, 34 light boats, and 41 brail vessels were permitted. Of these, 66 purse seiners and 26 brail vessels actually landed squid). In recent years, a tremendous abundance of market squid has forced the fishing season to close early because the catch limit was met (see San Francisco Chronicle story). Fluctuations in squid abundance are poorly understood and impossible to predict. Another problem is that scientists have no idea how big squid populations are either. Such gaps of knowledge make fishery management difficult. Nonetheless, we now know ocean temperature plays an important role in squid abundance. One day, we may be able to predict good and bad years for squid fishing by learning to forecast ocean conditions, much like we do the weather. In the meantime, much research still needs to be done. Phil’s Seafood Market, Moss Landing, CA. Excellent seafood dishes, including Cioppino. In restaurants, squid are commonly referred to by their Italian name, “calamari”. They provide a low fat, high protein seafood that is rated by Monterey Bay Aquarium’s Seafood Watch program as a GOOD ALTERNATIVE choice. One piece of fried calamari has about 1.5g of protein. According to Phil’s Fish Market owner, Phil DiGirolamo, squid from Monterey Bay does not shrink in the pan and maintains a unique flavor and texture that is unlike squid imported from elsewhere. This is one reason why locally caught squid are preferred in Monterey area restaurants. In addition to humans, many ocean species depend on squid for food. Aside from fish, birds, and marine mammals, various species of crabs, shrimp, octopi, and sea stars comprise a community of scavengers that feast on post-spawning squid. This fascinating YouTube video, Night of the Cephs, illustrates the importance of market squid to the benthic marine community. 1.) Climate change and its impact on ocean temperatures. Warming temperatures could be problematic for squid. 2.) Expansion of the much larger Humbolt squid from the south with warming coastal waters. Humbolt squid are voracious predators and enjoy the taste of Doryteuthis species. 3.) Hypoxia caused by upwelling events that draw cold, low-oxygen water from the deep sea onto the shelf where it can cause large-scale fish die-offs. 4.) Coastal pollution, especially in proximity of squid nurseries. Recent proposals to develop seawater desalination facilities along California’s coast could create dense plumes of brine that have the potential to sink and settle overtop the vast white carpets of egg capsules on the seafloor, if not properly mitigated. No one knows how brine will impact developing squid embryos or the many other species comprising marine benthic communities. Market Squid’s life span is typically 8-9 months. A single female produces approximately 3,488 eggs. Squid fishing began in 1863 by Chinese fishermen on Monterey Bay. Torches were used to attract squid at night from small skiffs. Today, many squid fishers are the descendants of Italian fishermen. Italians introduced lampara net technology in the early 1900’s. From 1916 – 1923, annual squid catch averaged less than 2 million pounds. Before 1961, the majority of squid were harvested from Monterey Bay. 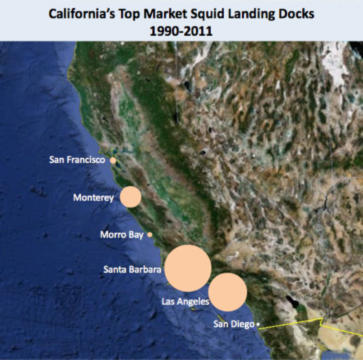 Prior to 1998, California’s market squid fishery was an open fishery with few regulations. (CDFW) Cal Department of Fish and Wildlife. 2005. Final Market Squid Fishery Management Plan. State of California Resources Agency Department of Fish and Game Marine Region. Available from: http://www.dfg.ca.gov/marine/msfmp/. (CDFW) Cal Department of Fish and Wildlife. 2006. Status of the Fisheries Report: California Market Squid. Available at: https://nrm.dfg.ca.gov/FileHandler.ashx?DocumentID=34420&inline=true‎. Zeidberg LD, Butler JL, Ramon D, Cossio A, , Stierhoff KL Henry A. 2011. Estimation of spawning habitats of market squid (Doryteuthis opalescens) from field surveys of eggs off Central and Southern California. Marine Ecology. 33: 326-336.